Lyle & Scott Sale is now on across everything including footwea and fashion! Established in 1874, Lyle and Scott have a prestigious history of knitwear imbued with an instantly recognisable Scottish vogue. Approved by the Duke of Edinburgh, this tasteful menswear range provides a man with all he needs to dress every inch as a sophisticated sporting gentleman. This premium brand is particularly suited to those who are never far from the putting green, as Lyle and Scott have their very own range of golfing attire. Whether you want to dress casual or are looking for some high quality sportswear, you will find everything you need with Lyle and Scott. They've even remembered to bring your umbrella! Add Lyle & Scott to your Favourites list and be the first to know every time they have a Sale on! 1st January 2018 - Lyle & Scott New Years Day sales for 2018. 7th May 2018 - Lyle & Scott Early May Bank Holiday sales for 2018, add to your diary now! July 2018 - Lyle & Scott Summer 2018 sales, joining us? 23rd November 2018 - Lyle & Scott Black Friday sales in 2018 start on Friday 24th November. 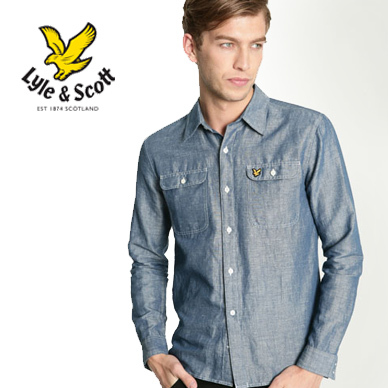 Add products from Lyle & Scott to your Love Sales list. Get the Love Sales button now! Lyle & Scott January Sale is now on across everything including footwea and fashion! Lyle & Scott Cyber Monday Event is now on with up to 30% off all clothing! Stock up your wardrobe today! Lyle & Scott Black Friday Event is now on with up to 30% off all clothing! Stock up your wardrobe today!